Thursday December 25, 2014 - Christmas Day - Even though our beautiful country is being hit by a vicious enemy that wipes out individual lives, lives of households and lives of communities tearing age-long friendships and communities apart, let us continue to give thanks. Let us continue to pray that the Almighty Lord will one day see Sierra Leoneans becoming themselves once more. Good Christmas to you all. Stay safe. It is Christmas Day - a day that would normally be celebrated all over Sierra Leone where such events are observed by all faiths as people come together to give thanks to God for being alive with the refrain - "Appy Krismes mi nor die o" meaning - Thank you Lord I am around to celebrate Christmas. I am alive". Many, we are afraid to say would not be around to say this on Christmas Day 2014 - ripped away to the great beyond by the terrible and devastating Ebola Virus Disease, EVD. 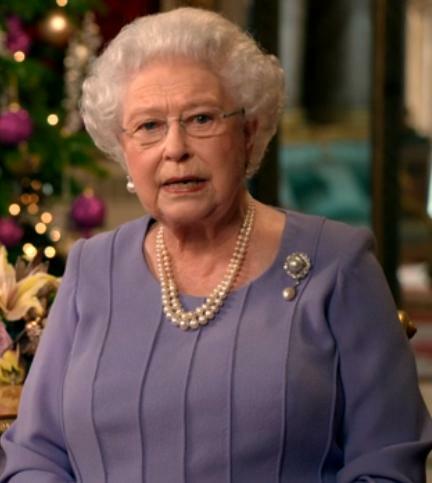 Her Majesty the Queen of the United Kingdom in her Christmas Day message paid tribute to those helping out - "...and I have been deeply touched this year by the selflessness of aid workers and medical volunteers who have gone abroad to help victims of conflict or of diseases like Ebola, often at great personal risk. For me, the life of Jesus Christ, the Prince of Peace, whose birth we celebrate today, is an inspiration and an anchor in my life. A role-model of reconciliation and forgiveness, he stretched out his hands in love, acceptance and healing. Christ’s example has taught me to seek to respect and value all people of whatever faith or none." The Head of the Catholic Communion, Pope Francis also made reference to suffering of children and the Ebola terror - "May Jesus save the vast numbers of children who are victims of violence, made objects of trade and trafficking, or forced to become soldiers; children, so many abused children. May he give comfort to the families of the children killed in Pakistan last week. May he be close to all who suffer from illness, especially the victims of the Ebola epidemic, above all in Liberia, in Sierra Leone and in Guinea. As I thank all who are courageously dedicated to assisting the sick and their family members, I once more make an urgent appeal that the necessary assistance and treatment be provided." 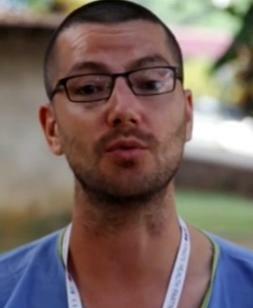 William Pooley, the nurse from the United Kingdom who survived an attack from Ebola while working in Kenema and came back to Sierra Leone had a message for everyone including the international community. His message was broadcast by the Channel Four television channel in a programme called the Channel 4 Alternative Christmas Message. "My exposure to this disease reinforced the belief that when people need help it’s important that it’s given. I realise I was incredibly lucky, lucky to be born in a wealthy country, lucky to be well educated, lucky to have access to the best possible treatment for this awful disease. Thousands of people here in west Africa have not had that luck. Thursday December 18, 2014 - Tragedy - more bad news from Sierra Leone. The event we had hoped would not be but sadly has now happened. It is with deep regret that we have to tell you that we have just been informed from Freetown that the good and great Dr Victor Willoughby is dead. The eleventh doctor to succumb to the ravages of the Ebola Virus Disease. Lord have mercy upon us as we battle the ravages of this treacherous and very cunning and elusive beast. Dr Victor Willoughby, the Freetown-based medico well known and respected by all ages, especially the old folks has gone to the great beyond. He was a good man and many would be weeping and wailing at the loss of a man who never forgot his humble roots. A man known for treating the old folks as he would treat and respect his own mother and father. 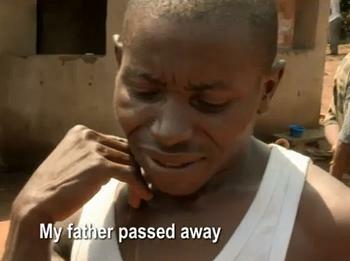 Sierra Leoneans are still trying to come to grips with this latest tragedy. Monday December 1, 2014 - Sierra Leone fails World Health Organisation (WHO) December 1, 2014 goal to have at least 70 percent burial and treatment for those afflicted with the deadly Ebola Virus Disease. And rather than concentrate on getting things right, the clueless and rudderless rat of a President is busy traversing the country threatening traditional rulers. Of the three most affected countries of West Africa, only Sierra Leone has failed in meeting the World Health Organisation's deadline of "70% of all those infected by the disease must be under treatment and 70% of the victims safely buried if the outbreak is to be successfully arrested" by today December 1, 2014. What we are noticing is that more people are dying every day as well as more people getting infected. And what do we get from the clueless rat at State House? He goes on a tour of the regions where people are forced to come and listen to his rant quite oblivious of the dangers of getting crowds together in an Ebola-infested country that is still grappling to get it right. While Guinea and Liberia appear to be getting their acts together figures released by Sierra Leone's Health and Sanitation ministry show that more people are dying and getting infected in the North as well as the Western area where the capital Freetown is located. The online outlet Sierra Leone Telegraph in a headline - State House frustrating efforts of the Mayor of Freetown to curb Ebola - stated - " On Wednesday 26 November, a family of eight living in one house was wiped out by the Ebola virus in Tengbeh Town – one of the most densely populated western districts of the capital Freetown, amid calls for a tougher approach to curb the transmission of the virus in the capital Freetown. But a senior government official told the Sierra Leone Telegraph this week that, State House is using party political expediency to block measures that the Mayor of Freetown – Sam Franklyn Gibson is putting forward to help reduce the spread of the virus in the city. 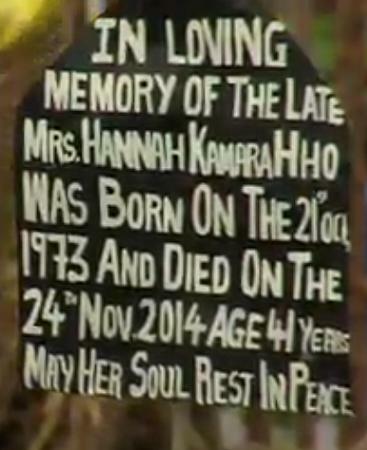 When members of the high-risk burial teams in Kenema protested against the non-payment of their risk allowances, the so-called head of the government's new anti-Ebola agency, NERC, flew into uncontrolled rage and reportedly ordered the sacking of all those who took part in the protests. We still do not know if those sacked workers have been paid their dues for the kind of risk the job entails or whether they have been replaced. Up to the time of writing this - we still do not know what salary and emoluments Palor Conteh is getting. Is he still getting a salary as Defence minister while getting paid extra for heading NERC? Many have been disappointed to learn that despite having an eighty-bed facility, only fourteen beds were occupied by patients - this in the midst of rising infection rates as well as deaths. The BBC's Andrew Harding's report of 30th November 2014 highlighted what many knew but were afraid of telling their UK benefactors - that there's a problem, an acute problem that needed a solution now and it is good to hear one of the Save the Children people one Michael von Bertele admitting the organisation's lack of experience in such a task. Monday December 1, 2014 - Update - As the world commemorates World Aids Day today we should be forgiven for thinking that the affliction should be given less of the limelight this year given the awful horror that is wiping out families, communities and whole villages in our once beautiful country. Inquiry into delayed treatment needed. The vicious and murderous rampage of the Ebola Virus Disease appears to have put the ravages of AIDS in the back burner - but who can blame us for this line of thinking? More so given that the directionless, clueless and thieving cabal headed by the rat at State House is an apology for planning, strategy and implementation of commonsense policies that should have contained the menace even before it got a hold on the lives of our people. Even as we think of ways and means of "Closing the gap in HIV prevention and treatment" - the theme of this year's World Aids Day, let us pay tribute to all who have perished especially the health delivery workers on the frontline - the nurses, doctors and associated teams like those tasked with the disposal of the remains of our departed compatriots - men, women and children of all ages. Let us pay tribute to their selfless work and let us remember Dr Martin Salia in whose honour and memory a special service was held on Saturday 29th November 2014. The good man passed to the great beyond on November 17. One news outlet had this - The 44-year-old surgeon was remembered Saturday at his funeral Mass as a tireless, selfless and heroic advocate for medical care for the less fortunate. Salia died of Ebola on Nov. 17 after being flown to a hospital in Omaha, Nebraska, in the advanced stages of the deadly virus. He became the second person to die in the United States after contracting Ebola in West Africa, where it has killed nearly 7,000 people. Ron Klain, the White House Ebola response coordinator, read a personal note of condolence from President Barack Obama to Salia's family. "The greatest heroes are people who choose to face danger, who voluntarily put themselves at risk to help others," Klain said. "Martin Salia was such a man." The 90-minute Mass at the home parish of Salia's family in Maryland drew a crowd that swelled to the hundreds. Relatives, friends, colleagues and dignitaries from both the U.S. and Sierra Leone were in attendance, along with Sierra Leonean immigrants from around the country, some of whom said they didn't know Salia personally. 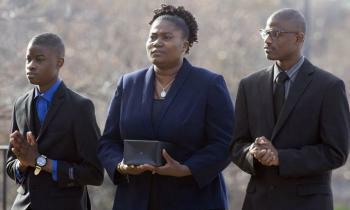 Salia's wife, Isatu Salia, wept as she carried a small black box containing her husband's cremated remains into the church, flanked by the couple's sons, 20-year-old Maada and 14-year-old Hinwaii. Given what we now know about the incompetence of Save the Children as well as the uncaring attitude of the thing which passes for a government headed by the rat, we would urge the government of the United Kingdom to press for an inquiry into the circumstances leading to the delay in giving Dr Martin Salia the vital treatment after he was tested and confirmed the second time round. We would want to know why it took so long for him to be flown for medical treatment in the United States and more importantly, why he was not given the vital treatment that could have saved his life in Sierra Leone. We need answers. 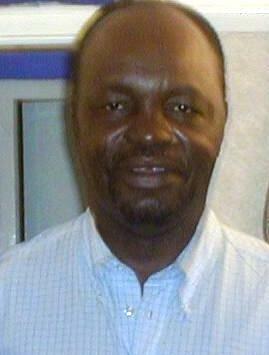 Friday October 31, 2014 - Blaise Campaore - the godfather of the murderous RUF is forced out of power in the face of unprecedented demonstrations against his attempt to get another five-year term. He was poised to have the constitution bent in his favour by a compliant Parliament. The people would have none of it. Warning smoke signals to the rat, our compliant Parliament and the equally compliant and self-serving Judiciary? The godfather of the evil that plagued our beautiful country for years, (the RUF) Burkina Faso President Blaise Campaore is no more in power, no more enjoying the trappings of a Head of State, never mind his known record and penchant for being the close buddy of rebels of various descriptions that had laid waste many a life and territory in the West African sub-region. Indeed one commentator on the BBC Focus on Africa programme today put it succinctly when he stated from Accra that Blaise Campaore should have been tried in an international court to face justice as was the case of Foday Sankoh and Charles Taylor. The rat and his kitchen cabinet at State House must be getting mighty jittery at the turn of events in Burkina Faso. This was the country to be first visited by him after he won the 2007 elections and up to now satisfactory answers have not been supplied by him or his hired shameless praise singers as to why Burkina Faso and Blaise Campaore should be their first port of call. Many theories had emerged - that he could have gone there to say thanks to Blaise Campaore for his support after he threatened that he would not accept the 2007 election results if he lost. This report by the Guardian gives an idea of the scale of violence as the people rose up against a dictator. 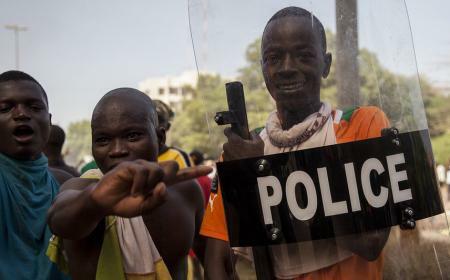 "Burkina Faso’s president, Blaise Compaoré, one of Africa’s longest-serving leaders, has been swept from power after 27 years by a violent popular uprising. Compaoré announced his resignation on Friday as hundreds of thousands of people took to the streets in protest at plans to extend his rule. 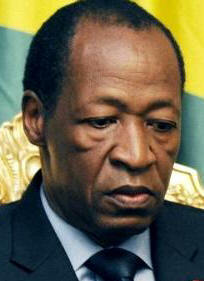 General Honoré Traoré, head of the armed forces, said he had taken charge of the west African country. Like so many strongmen before him, Compaoré was forced to abandon the luxurious trappings of the presidential palace and flee for safety as his regime collapsed. Nearly half the population lives on less than one dollar a day." This excerpt from the New York Times buttresses what we had been stating about this Great Satan of the West African sub-region - an unrepentant beast even as he is driven out of power - “For my part, I believe, I have fulfilled my duty, my only concern being the higher interest of the nation,” he said in a resignation statement that called for elections within 90 days. With a mix of guile, charm and impunity, Mr. Compaoré, a onetime disciple of the Libyan leader Muammar el-Qaddafi who was known as “handsome Blaise,” had built himself into a regional power broker. Mr. Compaoré's legacy is rooted in his dueling roles on the continent, both feeding conflicts in other nations and helping to resolve them. During the civil war in Sierra Leone more than a decade ago, American officials accused Mr. Compaoré of fueling the violence by funneling arms to rebels and sending mercenaries to fight alongside them against United Nations peacekeepers – in exchange for diamonds. In 2000, a United Nations panel concluded that it was “highly likely” that arms had been brought into Burkina Faso and then shipped to fighters in Angola in breach of Security Council sanctions." Lest we forget kindly take another reading of what we had written about the criminal enterprise of what passes for a Judiciary and the rule of law. Thursday October 9, 2014 - As victim from Liberia succumbs to the killer Ebola virus in the United States and health workers inadvertently take the beastly and treacherous virus to Europe we applaud moves by the United Kingdom, the United States and other concerned countries. Given the treacherous nature of the virus as it tries to kill health workers who challenge it, let us do all we can for the safety of these health workers so that their zeal will not flag. What we had feared has happened and the headlines have been running away with the story of "the first person to be diagnosed with Ebola within the United States has died...." and so on. This is the sad story of a 42-year-old man Thomas Eric Duncan who caught the virus while in his first home country of Liberia. This BBC page tells it all...of the rising hopes and expectations punctuated by hospital reports of his condition moving from serious to critical, and then like the case of our healthcare workers, the rising apprehension that our prayers could well have been in vain. We have another death on our hands. It would seem that the same delay in the treatment of suspected cases was deployed in the case of Thomas Eric Duncan as we read from the pages of US broadcaster NPR - "Duncan is believed to have become infected after he helped a pregnant woman with the disease into a taxi in Liberia that was to take her to a hospital. Hospital officials confirmed last week that Duncan had been sent home on Sept. 26 after an initial exam concluded he suffered from a "low-grade common viral disease." The hospital said that although a nurse, working from an Ebola checklist, determined that he had recently traveled from Liberia, that information was "not communicated to the full team." The two cases quite clearly buttress our belief that isolation, testing and immediate treatment is key to fighting the beast called Ebola and the delay in both the United States and Spanish hospitals to put immediate emergency measures in place shows either a dismal lack of knowledge of the how Ebola kills humans or a deliberate attack of amnesia as administrative and other silly, deadly ones at that, ramifications click into place. A very sad and tragic lesson for all those taking care of people with high fevers. We pray that health professionals all over the world will now advise themselves to eliminate Ebola as a first step when people present with a fever - especially if they are from areas where the beast rages. There is no excuse for this. 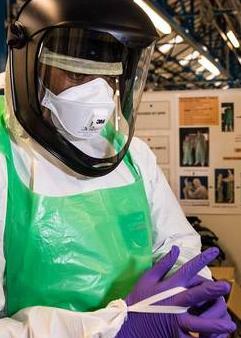 We have just seen on Sky news that a company has been contracted to send a hundred thousand protective suits a month to Sierra Leone as the UK steps up the fight against Ebola with seven hundred and fifty troops, a whole battalion, sent in to help. We welcome this and the latest US effort not only for Liberia which appears to have the largest casualty figures but for Sierra Leone and indeed the sub-region. Meanwhile a row is developing in the UK on whether airport screening at all points of entry should be in place after the US ordered that should be the case at five entry airports that would take a closer scrutiny at passengers travelling from the areas worst hit - Sierra Leone, Liberia, Guinea and Nigeria and indeed the whole of West Africa as the UK has the largest number of people coming from the sub-region. In the meantime, the Royal Navy medical contingent is preparing for its role in the fight against the treacherous and deadly scourge in Sierra Leone with the planned deployment of RFA Argus. We wish everyone involved in this battle against the beast every success. Saturday September 27, 2014 - Channel 4 programme - Unreported World is a must view for everyone concerned about the Ebola scourge as this programme vividly tells the story of the ravages of the vicious Ebola terror that is preying on the lives of the wary, unwary and all those who cross the path of the vicious terror. Last evening, Channel Four television in one of their programmes in the series Unreported World did a film on how the Ebola scourge snatches unsuspecting victims and as US President Obama observed - people just wanting to show love and concern to loved ones get ensnared in the web of death woven by the killer virus. According to Channel Four - "Unreported World provides a unique view of what life is like for the health workers battling Ebola in Sierra Leone and the families affected by the virus. In the time they were there though it was clear the battle to contain it was being lost." This pictures/film clips/film was done while the government was still in denial of just how serious the outbreak was and just before the rat finally declared it was a situation that demanded the formal announcement of a health emergency throughout the country. This film should be carefully studied because there are key lessons to be gleaned from it which should make clear that though the Ebola virus attack can be extremely deadly with over fifty percent fatality, the beast can still be controlled if suspected cases are tested, isolated and treated in as speedy a manner as is possible. This Channel Four film is a great eye opener and we salute the brave reporters, camera crew and everyone involved in bringing to the world the real story of the disease and how it affects ordinary people, families, communities as well as the fears and myths associated with it. We have got stills from the film to highlight the story of a Sierra Leonean called Fallah, his wife Kadiatu, their four children and most poignantly, the fate of poor seven year old Fatmata who died after her mother and a grand parent succumb to the disease. The film brings you the cries of the poor girl as she shouted - "I am feeling cold". There was the case of Kadiatu and her husband Fallah. 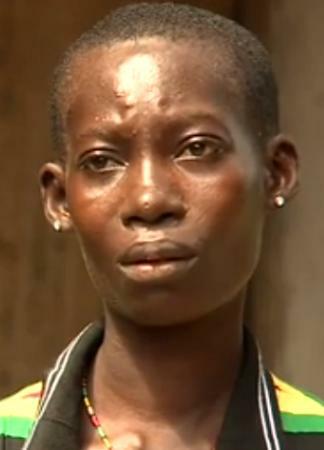 It was Kadiatu who first started complaining of fever conditions, vomiting and frequent visits to the toilet. Worried relations contacted health workers who came and took Kadiatu away. She looked in a bad way but it would seem that with proper treatment, her own body's immune system was encouraged to build up and fight the invading horror. From a listless and helpless individual, Kadiatu became a symbol of hope that all need not be lost when one is tested positive for the killer virus. We have just seen a Voice of America report which paints a sad picture of the Ebola situation in another area of the north - Makeni. Let us continue to pray that we succeed in this fight against Ebola but as we continue to stress - prayers should go hand in hand with practical solutions as to how the scourge is to be contained. Prayers should go hand in hand with positive and common sense in a country where the road to Kailhaun is a death sentence for patients. Victims must be given the first available emergency care where they are proved positive for the deadly scourge with the necessary measures put in place. Please do not subject victims to long road journeys that can last anything from six to ten hours. It is like a death sentence aimed at prolonging their agony before death. Let us pray and do something positive. Wednesday October 12, 2011 - The truth is finally out. Now we know why the high priest at the altar of falsehood, profanities and indecency dedicated to the smoke and mirrors President expunged those articles from his web site reaffirming once more that for a few dollars more he would be willing to lie on oath in order to earn his supper. And this from a so-called man of the cloth who has been caught out more often than not - lying to his face and feeling good about it. We now know why those articles were expunged from the web site of the high priest who thinks nothing of lying through his teeth to please his masters at State House in Freetown. Remember what he wrote about the Bo incident in which one man was reported killed by the police, some structures belonging to the APC ruling party torched and the flag bearer of the main opposition SLPP Brigadier (Rtd) Julius Maada Bio got hurt? 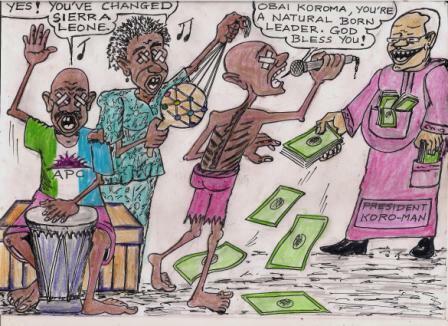 The pro-APC, pro_Ernest Bai Koroma publications had a field day with each tabloid trying to outdo the other in presenting a feel-good article that would be pleasing to their paymaster/s at State House. It was a time to write articles pleasing to their handlers at State House. And please recall too that when the President ordered an investigation, we pleaded that no comment be made that would somehow appear to blame anyone? This piece of advice given in good faith was ignored and just to please his master, his mammon at State House the high priest at the altar of lies, falsehood and profanities dedicated to his god ernest bai koroma published articles blaming people left, right and centre as well as here, there and everywhere and even going as far as to suggest that there was no one at the APC party office in Bo on that day? Well we now have a copy of that report and we can state here that the reason why those articles were expunged was because the report showed that what had been published, as usual was a big and deliberate lie aimed at keeping his master happy. And pleasing his master we doubt very much because we know that there are good and honest people at State House, real professional journalists and civil servants who would always frown on anyone who on one hand gloats about a diplomatic appointment while on the other becoming the chief fabricator and purveyor of lies, more lies and damned lies. Below are some of the headlines, the articles of which were expunged and for which action we demanded an explanation. None was forthcoming, none was expected. That is what happens when you, as we say "broke congosah" on the gossiping liar's head. Where is the blood ? The biggest hoax since ‘Janet Bundle’ ? 1. The SLPP thank you rally was legal. 2. That Rtd Brigadier Julius Maada Bio was indeed wounded during the attack. 3. That the APC Office was occupied by APC supporters on the day of the attack and that even before then preparations had been made to attack the Maada Bio march in Bo with instructions given to women allied to the APC to collect stones. 4. Stoning was started by APC supporters from their party office. 5. The SLPP supporters attacked and torched structures of the APC. 6. One bike rider was shot and killed by a named policeman who still remains free. We will now bring you most of the expunged articles so that you can see further proof of the devious methods of a compulsive liar and we daresay the typical "kongosah bench" carrier.